Everything from the shot composition to the narrative structure to the character dialog and pacing is just dumb and indulgent. I dislike just about every aesthetic choice aside from the beautiful lighting and clearly mixed dialog. At first, I found the 'sci-fi' element detracted from the core story about Mr Chow's attempt to fill the gap in his life left by having been In the Mood for Love. However, on a second viewing I saw that the digression into the 'future' shed crucial light on the 1960s portions. The triptych together is possibly the greatest cinematic accomplishment of my adult life. It certainly speaks deeply to my own experience. The who, where, when, and why barely matter in any literal sense. The important thing is the perception that these images and encounters are relative to a shared universe established in Wong's previous films. The future is past, and memories are indistinguishable from fiction. This is his most abstract and impressionist work, so the primitive CGI - used sparingly anyway - actually seems somehow appropriate. Me: That was so beautiful and touching. Wife: What was it about? Me: Yes. My probable score for this was '90', but it probably didn't take into account how I would feel about the movie treating women. Androids? Clingy? Crazy? Newp. newp. newp. This was a very self-congratulating 'man is a genius and the women around him are props. Woe to him'. Other than that, yeah, it was well made but had nothing of the subtlety and longing of 'In the Mood for Love'. Oh, and that damned voice-over. I roll my eyes. Yeah, no. In The Mood For Love was beautifully subtle and sewed plot threads and characters together beautifully while having consistent beautiful visual style and great performances. 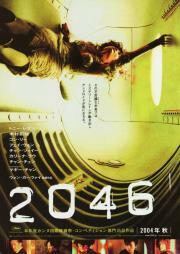 2046 in comparison is a disaster - the main character is unrelatable, the relationships are dull, the futuristic storyline clashes in style and meaning, and there's no plot to carry you through, the visual style is a poor copy of ITMFL, and performances are dull. 2046 proves undoubtedly that Wong Kar Wai is a fancy director of melodrama. It's arguably his most beautiful film--the color balancing is extraordinary and the cinematography surely ranks among the best of the 00's--and the complicated, time shifting narrative adds much needed depth to WKW's sensualist style which can be overly simplistic. It's also his finest work, a ravishing melancholy meditation on the relationship between time, love and memory that is rich in texture and mood. The link between Wong's early career of slice-of-life romances and his more ambitious latter days. He traps many ideas about the romantic knots of nostalgia and creativity in the dense net of narrative ambiguities, but its cerebral tilt doesn't betray the emotive essence that drives the movie, even as it batters Wong's legacy. It may be one of the most complex romances of all time, pairing the abstract emotionality of The Double Life of Veronique with the volatile passions of Godard's Contempt.